Another week, another wiww post! Let's talk about this necklace for a second. GORGEOUS! I got it off a Very Jane deal and I can't wait to style it again and again. Its a nice sparkler and makes such a big statement. Especially to my bleh outfit! Last week we were moved to another office space because our area was being reconfigured. So I had to visit another bathroom. It kinda goes with my outfit though :) I picked this outfit out at the last minute that morning. I loved the turn-out! I wore this on Monday. I got quite a bit of looks from all kinds of people. But hey, I'm not ashamed. I think this outfit was the perfect pick-me up for a Moanday. I found this cute top in the girls section at Target! It was just what I was looking for a white top with black polka dots. And these chunky heels made their debut this week and they were super comfy. I love it! 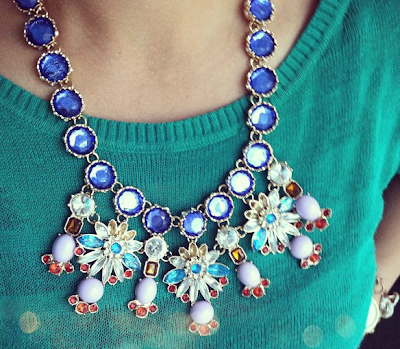 Love your cute outfits, especially the last look with the bright necklace! OH I just love all the outfits but 2 & 3 are my faves! Who cares what people think!! you look amazing in all the outfit but I absolutely love the second one!!!! That necklace really is so pretty. And ll the polka dots!! I love them. I love all the polka dots! Great outfits! LOVE all the polka dots you have going on here!!!! Outfits two and three are my faves. :) You're gorgeous!! I love your taste! Those necklaces are all terrific and you styled them perfectly by allowing them to pop off simple clothing. Beautiful looks!